As Prometheus begins, we are moved, like a bird, through clouds, over a beautiful landscape—a terrain with rivers and mountains leveling off to geography that seems too familiar to be alien. The planet has everything to sustain life as we know it today on Earth—or so it seems. Could it be Earth? Of course, it could. Is it for sure? We have no way of knowing…yet. Is it in the present, or is it millions, or perhaps billions of years in the past or future? There is no way to tell. Just as we become comfortable with what looks so familiar, we see the shadow of something large overhead. (Could it be a spaceship?) A humanoid figure appears, and…suddenly things are no longer anything we know on Earth. Next, the year is 2089. Archaeologist couple Dr. Elizabeth Shaw (Noomi Rapace) and her boyfriend Charlie Holloway (Logan Marshall-Green) discover a 35,000 year old cave painting dating a full millennium before other such discoveries. Yes, similar paintings have been found from cultures spanning thousands of years and thousands of miles apart. They all show a large human (or so it appears) pointing skyward to the same place. Could the paintings be a connected? Could they be, as Dr. Shaw believes, an “invitation”? The science exploratory vessel Prometheus, with its crew of 17, emerges from the vastness of space, somewhere, in what is now the Earth year 2093. After two and a half years of travel, the Prometheus has finally come within range of LV-223—a moon orbiting a planet in the solar system depicted in the paintings of the ancients. Could this moon hold the answers to the mysteries of our origins? Could it be our salvation? Or, could it hold the seeds of our destruction? Within the space of fifteen minutes, Prometheus has introduced its viewer to no less than three worlds—one that could be Earth (in some earlier or later time), one that is Earth, and another that is definitely no world we know. Regardless of the true setting of each, it is certain that they must all have something crucial in common. What this is we have yet to know. Or, at best, we have yet to know the clues to make our best guess. 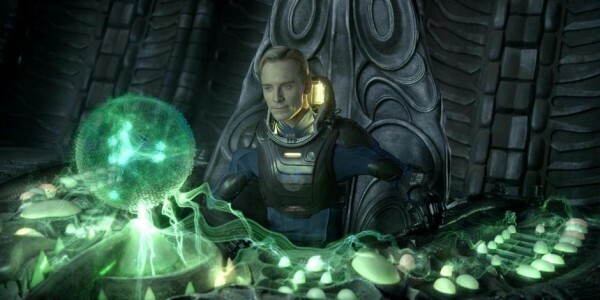 Yes, already, within these first few minutes, Prometheus has done what only the best of science fiction films ever do; it has created the strongest and most compelling sense of wonder and desire to know more. Yes, our “disbelief” has been more than temporarily “suspended.” After three viewing of the movie myself, my disbelief is still suspended. I’d bet my 1979 Kenner Alien that the humanoid figure I saw in 3D, next to the waterfall, was really there—or so my memory tries to tell me. I must admit that Prometheus was, for me, the most wished-for and then highly-anticipated movie in my lifetime—after the 1979 release of Alien. I had the highest hopes that under the skillful, dedicated watch of Sir Ridley Scott himself, that this movie would preserve and strengthen the integrity of the iconic story we all know, building the mythos even further. Yes, I am happy to say that 33 years of waiting finally produced everything I had hoped for and then topped it with even more. With the largest of predecessors to measure up to (namely Alien), it did so with all the stealth and force of its trademark xenomorph. The story is rich, deep, and thoughtful like the best of science-fiction should be, giving anyone much to think about long after the movie’s over. Why is there so much to think about? If you’re actually asking that question right now, you probably haven’t seen the movie. You probably should stop reading this right now, and go see the movie—before I reveal even so much as a minor spoiler. Yes, Prometheus is one of those rare movies that can’t even be talked about, in any purposeful way, without revealing what could be too much. It’s a movie where every detail and every point for discussion is better seen and heard first on screen, free from the influence of anything even I may have to say. Yes, even me! If you’re still reading, let’s get back on course to our destination—here, the goal of discussing why Prometheus is a movie not to miss. The first major reason is that Prometheus is a movie for fans in the know as much as it is for the casual movie watcher who knows nothing of the story. From the moment we get our first glimpses inside Prometheus (the scientific exploratory vessel itself) we are treated to visions of welcome nostalgia. The Prometheus is not some unexplained departure from the style of spaceships like Nostromo—not a rogue design from another time and place; instead, it is a welcome and logical predecessor of what we know. It has the now-classic, interior walls (appearing cushioned with rectangular tiles) and passageways we’ve seen before—complete with airlocks at various points along the way. It’s neither too technical nor underdone for its time; it’s just right. Also, we have that slow buildup of setting aboard the ship; the camera pans through hallways, taking its time, as it shows us exactly where we are. Nothing is hurried. Yes, the viewer is comfortable, from the beginning (especially as a fan), that this is, indeed, the right place. Of all the different things that someone could have done, alas Sir Ridley did it right! To use the cliché, he didn't fix what wasn't broken. 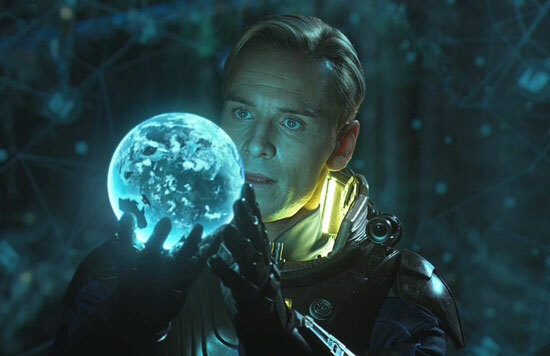 Next, we are introduced to David (Michael Fassbender)—the latest in Weyland Industries' android technology. He maintains the ship while the crew is in stasis, waiting for their destination (yes, just like in the original Alien). Unlike androids after him (Ash and Bishop), David is more human-like in his ability to be creative as well as malicious—working for or against his creators. In the end, is David another Ash? Or, is he more like a neutral Bishop, incapable of even the concept of harming a human? While I won’t tell you the answer, I’ll say that the process is, again, logical and satisfying, fitting well with the Alien plot we know. The Prometheus crew is another group who are best described as real people. Like the crew of the Nostromo, the Prometheus crew is exactly like those you would to find anywhere—whether on a spaceship billions of miles away or shopping in your local Walmart. Most—with the exception of Dr. Shaw and Charlie Holloway—are there to earn a paycheck and not for small talk or forming friendships (again, just like in the original Alien). Elizabeth Shaw (Noomi Rapace), Charlie Holloway (Logan Marshall-Green), on the other hand, have a passion for the mission. As Charlie says, after arriving on LV-223, “It’s Christmas, and I want to open my presents!” They are there regardless of the paycheck. 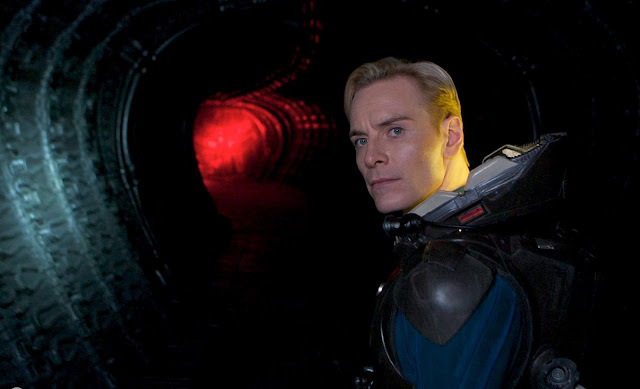 David (Michael Fassbender), as mentioned earlier, is an android, ambiguous in his position as a threat, protector, maintenance man, or all of the above. Meredith Vickers (the beautiful Charlize Theron) is the overbearing woman in charge, asserting more power than she actually has, ruling mostly by the front she presents. The captain (Idris Elba) is the perfect space cowboy figure, willing to do whatever it takes to protect his fellow humans back home—even if it means sacrificing himself. The elderly Peter Weyland (Guy Pearce) is perfect as the cold, calculating, fatally-selfish billionaire businessman he needs to be. Ford (Kate Dickie), Milburn (Rafe Spall), Fifield (Sean Harris), Chance (Emun Elliot), and Ravel (Benedict Wong) are the standard crewmembers, but far from standard in their performances. As in Alien, each crewmember, no matter how potentially generic, stands out with a unique personality, driven by the skill of the actors themselves. Yes, the acting, all around, is truly outstanding; a ten-rocket, Space Jockey salute has been launched for that alone! 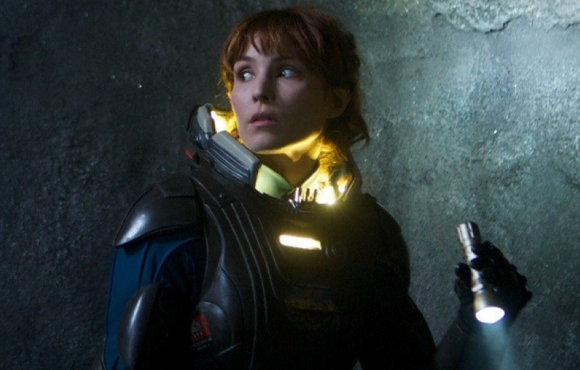 Speaking of acting, no review of Prometheus could be complete without a separate paragraph about the stellar performance of Noomi Rapace as Dr. Elizabeth Shaw. Noomi’s previous fame was mostly grounded in her portrayal of Lisbeth Salander in The Girl with the Dragon Tatoo, The Girl Who Played with Fire, and The Girl Who Kicked the Hornet’s Nest. Of course, the U.S. remake of The Girl with the Dragon Tatoo brought more attention to the originals, and, of course, more attention to Noomi Rapace. 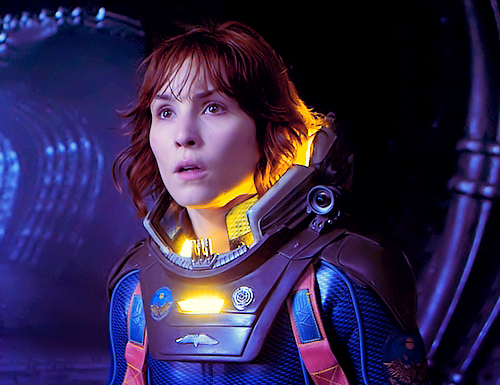 However, Noomi’s performance in Prometheus has given her a well-deserved, permanent place on the pedestal of iconic movie characters. Is Elizabeth (under Noomi’s acting skill) just a character? 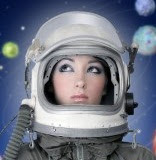 Or, is she perhaps another sci-fi movie heroine, rivaling even her counterpart in another time—yes, even Ellen Ripley? Oh, and let's not forgot to go back and stress the importance of the acting talents of Charlize Theron (as Meredith Vickers) and Michael Fassbender (as David). Without the stellar performances of these two seasoned professionals, I'm not sure where Prometheus would be on the rocket meter today—even with all else it has going for it. They were truly perfect in their roles, giving the movie an impact it could not have achieved otherwise. Charlize Theron is the paragon of a fully-in charge wannabe, insecure knowing she's not, with all the necessary ability to put up an effective façade; the fascist force of her performance is almost robotic, actually giving the captain, Janek, (Idris Elba) cause, if not for other reasons :), to acuse her of being an android. (He actually gets quite a treat for voicing this suspicion, as well.) Michael Fassbender (as David) is, quite simply, the perfect android. First, his natural appearance and features are exactly as ideal as anyone would expect for an android. He also perfectly portrays David as apathetic, yet empathetic in an eerie but comforting way, as only his expert talents could do—and as anyone would expect an android to be. I cannot think of another actor who could have played the part as well. Fassbender's performance as David offered many of the movie's brightest highlights, and his character was, by far, the most compelling and interesting to watch. How are the special effects? They are simply out-of-this-world awesome! (Yes, the "out-of-this world" metaphor works appropriately and accurately here, for sure!) Everything was real enough that I, for one, felt like I was there—all three times (and counting) that I’ve seen the movie so far. Oh, and don’t even think about seeing Prometheus in 2D. Lose the budget for a day, and shell out the extra few bucks to see this one in not just 3D, but IMAX 3D! 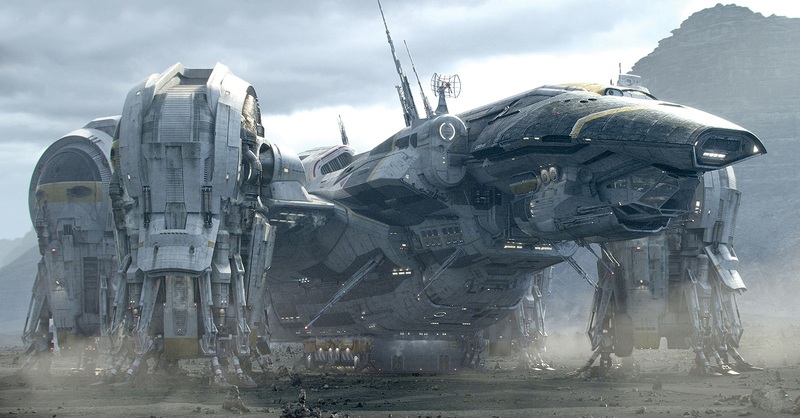 Prometheus was made for 3D, and every little bit of it shows! The scene with David in the pilot’s deck of the alien ship interacting with holograms is enough of a reason to go 3D. There’s nothing like being able to reach out and grab a few of those planets that float past your head in the theater. Oh, and there are lots of other reasons for 3D, but I’d have to tell you too many details to talk about it. Normally, I don’t make sure recommendations that make you spend more money, but I will here. Spend the extra money! “What about the sound?” Well, let’s just say that my seat vibrated in the theater as the Prometheus landed. It was the closest thing to being there, other than well…being there. While those thrusters pounded the ground and the engine roared for the landing, I was feeling like I needed to get out of my seat to make room—and keep from being blown away! Awesome, Sir Scott! Awesome! “What about the action, drama, and edge-of-your seat suspense—is there plenty of it?” you say. Dr. Shaw’s experience (or should I say nerve-shredding trauma) in the surgery machine alone is enough to say “Hell yes!” to the first question. Could this scene rival the famous chestbursting scene in the original Alien? I'd say it at least comes in a close second. The surgery was bad enough; but being trapped in a sealed pod with a kicking, screaming xenomorph is double, triple, or even quadruple bad! Here, David's Peter O'Toole quote from Lawrence of Arabia comes back to mind, at least in how difficult it is to really do it—“The trick, William Potter, is not minding that it hurts.” Yeah, right! Other instances of body-violating trauma only add more icing to the cake. (Yes, only in an Alien film could you say that, and not sound demented.) If this movie doesn’t get your adrenaline pumping, check your pulse; you’re probably dead. 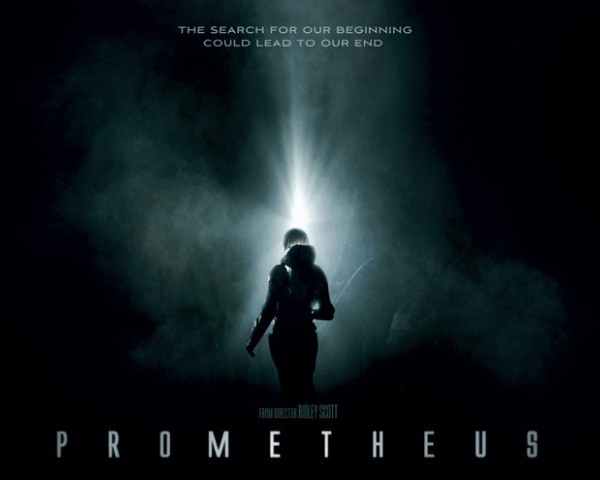 “Is it easy enough for a non-Alien geek like me (no not actually me, of course) to enjoy Prometheus?” Absolutely yes! Alien lovers in the know (as well as couples without an alien on the agenda) will be anywhere from enlightened to entertained—whichever is preferred or possible. Melting space helmets, molecular acid, and worms in the eyes (yes, you read that right) are just a few of the things to keep your heart rate up for more than two hours, for sure! “Oh, and what’s this Prometheus title have to do with it all?” That makes, I think, one of the more mysterious and obvious of metaphors. In case you don’t know, Prometheus was the Greek god who first created humans by molding them out of clay; he later also stole fire from the gods, giving it to humans—an act enabling progress and civilization. For these crimes, Prometheus was punished most severely. Now, by telling you that, I’ve likely revealed nothing, and…more likely…created even more curiosity. That’s good! I’ll leave it there! But, like Elizabeth below, be careful looking for answers! One of the major things I love about Prometheus (from an Alien geek’s perspective) is seen as the ship approaches the surface of LV-223—the alien planet (or moon, as it is). The dome-shaped structures on the planet are a sight to behold. True lovers of the original H.R. Giger concept art (for Alien) will make no mistake in recognizing these. They are none other than the “Egg Silos,” as seen in the Giger’s surrealistic designs for the 1979 classic. Also everywhere are Giger’s trademark biomechanical designs—lifeforms and structures fusing organic and mechanical elements into dark and dangerous, but oddly beautiful surrealism. In Prometheus, Giger’s art comes to life as well as ever before. Oh, and how refreshing this is for me—a true and dedicated fan—to see the story, after 30 years, getting back to its origins! Yes, the Prometheus has landed, and Giger is onboard! Another of the countless things I like about Prometheus is the course of action by the crew, after the ship lands on LV-223. In the spirit of the original, and in the style of 50’s sci-fi, the crew wastes no time in suiting up to go out and face the frontier ahead. Complete with bubble-helmeted space suits and lofty expectations, they explore without even the thought of needing a weapon—except for that one stubborn wise guy, packing force no matter what the others say. Yes, there’s always one in every group, whether or not it ever really matters. "What do they find, once on the alien world?" Ah, now that’s where I have to start creating my own plot holes. Let’s just say that it’s a nonstop adventure/thriller/sci-fi spectacle to rival the best of anything you’ve seen before. Will there be aliens? Will there be facehuggers that violate your body, gestating within you, before they burst forth, discarding your body, leaving you wasted, mutilated, and dead? Who are the “Engineers,” and where did they come from? What's that big face statue? Do they worship a god as well? Will there be Space Jockeys (not from Space Jockey Reviews, of course :)) in the cockpits of not-yet derelict ships, ready to unleash their cargo on other worlds—perhaps even our own? I could go on and on with more questions than you’ll ever imagine—that is, until you’ve seen the movie! I could even attempt to answer some of these questions, based on what I've seen, but I won't—at least not in this review. Yes, there’s a lot more I could talk about here; I could go on for pages and pages, nearly depleting my website’s inode limits, and still not be done. There’s just that much to talk about! However, I I’ve decided to save that for another time, sparing everyone the thrill that awaits them in a theater (or should I say spaceship) nearby. A final obvious question relates to the original. 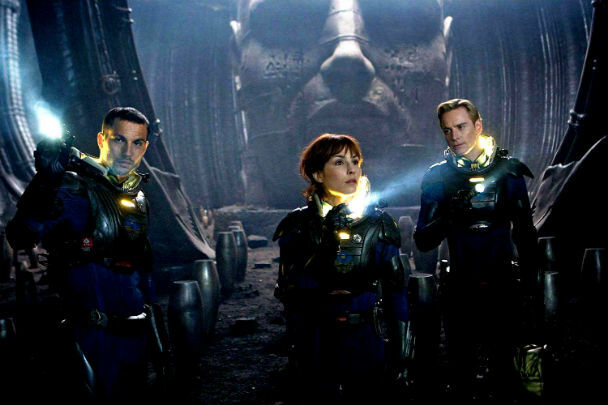 Is Prometheus as good (or, I should say, as awesome) as its predecessor—Alien? No. However, before you consider that an insult or point of criticism, let me remind you that I never expected that it would be. The original Alien is my all-time favorite movie. Nothing can touch it in its perfection—in all the ways it did everything just right. The suspense, originality, special effects, acting, characters, on and on were beyond comparison. But, that's not to say that others—such as Prometheus—cannot still be awesome. Yes, Prometheus is, even in competition with Alien, an awesome movie all around; even the word “awesome,” for me, doesn’t quite give it full credit. (I’d almost need to invent better, perhaps more alien words to describe Prometheus and Alien.) 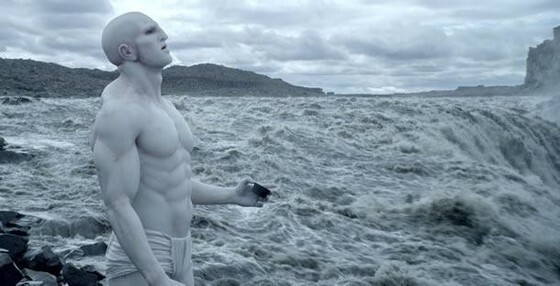 In the end, one of the greatest, most awesome things about Prometheus is that it didn’t answer all of the questions; better yet, it posed even more questions. Director Ridley Scott, I believe, realized that the uniqueness of Alien (1979) was based largely in the mysteries it left behind—all of the tidbits of clues and mountains of questions it left for us to think about, talk about, and wonder about for decades thereafter. I am one of those lucky fans who began wondering all those years ago; today, I am one of those fans who happily wonders still. 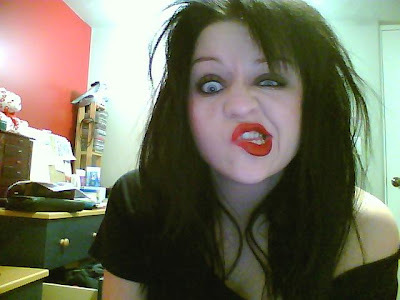 Yes, I know this is a movie review website, but I just had to make a small exception for this awesome artist and gorgeous girl of goth--Miss FD! Besides, her music video has everything to make an exception that...well...isn't really an exception at all. Miss FD is an out-of-this world, ten-rocket performer with everything she does, making videos that are much like movies anyway. The song and video that just blew this Space Jockey's rockets beyond the stratosphere is one called "Love Magick." What a captivating song it is with, again, all the things that really make it fit right in here on Space Jockey Reviews. There are hungry zombies vying for Miss FD's love (or should I say, flesh), while she fights them off with hearts that explode and disorient them until...well, until they mindlessly fall in love all over again! (Yes, that's what I call real "undying love.") It's also complete with bats, a full moon, and even a creepy castle in the background! Did I mention that the zombies are dancing? Yes, they are, and not doing a bad undead job of it either! Great special effects and even acting tell a story with music that, again, fits right into any category here on Space Jockey Reviews! Technically, this video could even be called--without much of a stretch--a short horror film (wink, wink). Perhaps even a musical! Yes, being the Editor in Chief does have its priviledges. Miss FD is such a compelling damsel of darkness that she's even a no brainer choice for a mindless zombie. Watch Miss FD's video below, check out her stellar website, and follow her on Twitter as well. There are lots more great gothic gems to be found there! On the Space Jockey control panel, Miss FD's music is always set to launch! I absolutely love "Love Magick." Enjoy! Check out Miss FD's website by clicking here! Check out Miss FD's Facebook page by clicking here! 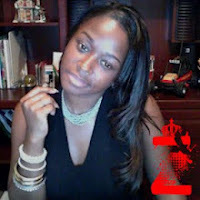 Check out and follow Miss FD on Twitter by clicking here! “Love Magick” is on Quantum Release Records. The video was directed by Adam Alvarez, with background illustrations by Josh Smith. Space Jockey Reviews is pleased to present the much-awaited, official trailer for the independent, dark fantasy film, Rose White. “Based on the Grimm Brothers' fairy tale Snow-White and Rose-Red, Rose White pits dark reality against an even darker fantasy, in a world where there are no happy endings.” Rose White comes from filmmakers Brian Kilborn and Daniel Kuhlman and stars Deneen Melody (as Lilly) and Erin Breen (as Rosalyn); it’s produced by Breakwall Pictures in association with TinyCore Pictures and features original music by composer Matt Novak. "Through Lilly's eyes, the world is a dark but beautiful place, where she and her sister, Rosalyn, live happily in the heart of a deep forest. In reality, however..." To not spoil anything, lets just say that, "in reality," things are much different. From the trailer, Rose White appears to be a real-world adaptation of the classic fairy tale, with the type of dark themes that original fairy tales actually had; it looks fresh, gritty, and above all...very interesting! You'll have to watch the movie to see what it's all about; but, I'm sure you'll enjoy that anyway. Rose White stars Deneen Melody, Erin Breen, Dan Kuhlman, and Tom Lodewyck. It's written by Dan Kuhlman and Deneen Melody and directed by Brian Kilborn and Dan Kuhlman. It looks great! Enjoy the trailer below! Check out Deneen Melody's website by clicking here! Check out Erin Breen's website by clicking here! Check out the Rose White Facebook page by clicking here! 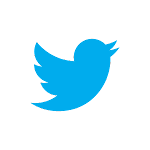 Check out and follow Rose White on Twitter by clicking here! Okay, all you ALIEN lovers out there, get your Broadway binoculars cleaned and your pulse rifles ready. It's time for the bio-mechanical black-tie event of the decade (well, at least for the week anyway). Just in time for the release of PROMETHEUS, we have a great little musical version of of the perennial favorite and undisputed sci-fi/horror classic, ALIEN. It's appropriately called (no, you didn't guess) ALIENS: THE MUSICAL. Yes, just when you thought some things cannot be musical...think again! Just when you thought some things were far too other-worldly and alien for Broadway adaptations...think again! The title song--"Far Away From LV426" will actually grow on you (or should I say, in you) like...well, like a facehugger gestating in your chest, erupting in a bloody crescendo of song, but not dance, leaving you writhing on the floor, fighting for your bloody life. Okay, maybe that metaphor is a little extreme, but it's certainly appropriate for the circumstances. 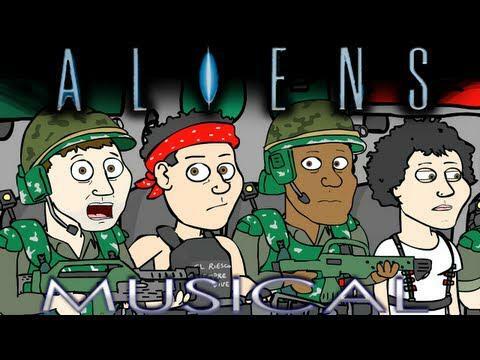 The music, lyrics, and video editing for ALIENS: THE MUSICAL are done by Jon Kaplan and Al Kaplan (Conan the Barbarian: The Musical, and Off-Broadway's Silence! The Musical.) In this sure-to-be new classic, Newt and Ripley sing "Far Away From LV426". The word is that "They sing at night, mostly." Reminisce and...by all means...enjoy! Oh,and sing along too, if you like! 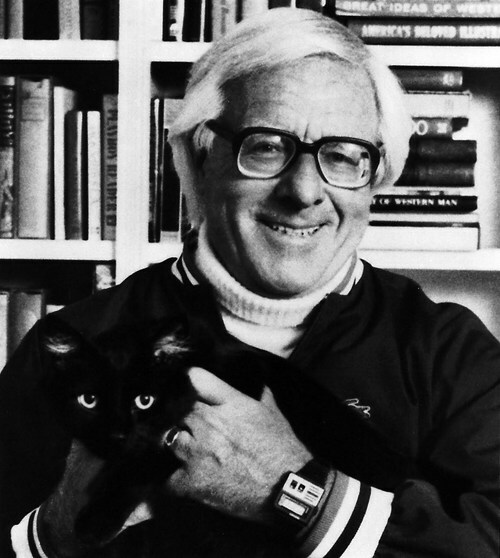 Space Jockey Reviews is sad to report (along the so many others) the passing of the science fiction legend, Ray Bradbury. The author of such classics as Fahrenheit 451, The Martian Chronicles, The Illustrated Man, Dandelion Wine, and Something Wicked This Way Comes died this morning in Los Angeles, at the age of 91. With his influence on science fiction, he has surely left the world a better place than it would have been without him; but now, without him, today, the world shines less brightly than before. To all of those who loved him and his work, yes, there surely is a difference to be felt. It will, of course, be impossible for anyone to fill the void of his absence. His impact on science fiction literature and films has been (and will continue to be) immeasurable. However, Mr. Bradbury, I'm sure, would have the greatest confidence in the imagination in us all fueling the stars of creativity to infinity--and yes, even to some magical, yet-unknown place beyond. So, in the spirit of his life, his work, and his undoubted hopes and dreams for us all, we should remember him, while looking to the future. He has shown us the potential of the human mind, and what, still yet, is on the forefront for us all to discover. To dream, think, and create, he proved, is to know no limits. Ray’s legend will live forever; so, in a way, he hasn’t left us at all. Bradbury is survived by his four daughters, Susan Nixon, Ramona Ostergren, Bettina Karapetian, and Alexandra Bradbury, and eight grandchildren. His wife, Marguerite, predeceased him in 2003, after fifty-seven years of marriage. Ray Bradbury receives a ten-rocket salute here at Space Jockey reviews for all he has added to the world, as well as all his influence will continue to add. He will be greatly missed, but never forgotten. JENNY KRUEGER'S MEMOIRS OF A SCREAM QUEEN--Where Chris Rennirt is the 150th Follower! Yes, you read that right! Chris Rennirt (that's me--the one and only Space Jockey Reviewer) became the lucky (or fateful) 150th follower on Memoirs of a Scream Queen--the superstellar website posted and hosted by none other than Jenny Krueger, THE Scream Queen herself! What chance or forces of fate in the cosmos were steering my fingers as I clicked on that "Join this site" button at that moment in time, I cannot know--but that it happened is surely a fact. More fortuitous things have surely come to pass in the cosmos, but surely none so well appreciated by me. Why? It set in motion a cause/effect relationship that made me the subject of a feature post! So, to start things off, a great big Space Jockey thanks goes out to Jenny Krueger! Thanks a bunch, Jenny! It is greatly appreciated! Now, rather than go on about myself, I'll tell you more about the whole lot there is to know and appreciate about Jenny Krueger--another gorgeous girl of gore! Yes, you might ask how an article that seems to be about Chris Rennirt can actually be about Jenny Krueger. Rather than even trying to answer, I'll just defer to Jenny's own words: "It's better to be random and shocking than 'normal.'" Random, I will surely be. Shocking? Not yet anyway. Now, that's what I call honesty you can trust as far as the Space Jockey Rockey can travel--and that's really far! Trust me though! With or without spoilers, you will want to read Jenny's movie reviews. They're just that good! That's coming from one already-addicted reader (and writer) of movie reviews myself. At last view, Jenny has 97,431 pageviews, and yes, 150 devout followers! WOW! What a well-deserved following of scream queen loving fans she has, with many more in the very near future, for sure! Below, a gothic Jenny shows us what a real scream queen can do with a lovely face! That's a face that horror lovers, aliens, and general audiences alike can easily love! Regardless of the horror, the beauty cannot be hidden! 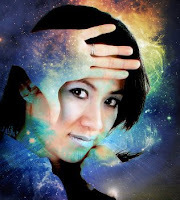 Here's more interstellar info about Jenny, straight from her profile! Good stuff here; check it out! My name is Jenny Krueger. 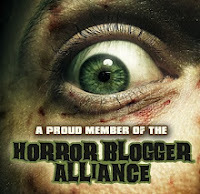 Horror Writer, Scream Queen, you're IT girl for all things Horror. I currently reside in Utah trying to move to California to work for FEARnet or Bloody-Disgusting. The Zombie Apocalypse is among us. You've been warned. Writing, Blogging, Music, Movies, Zombies, Make-up, taking pictures, goofing around and having fun. A Nightmare On Elm Street, My Bloody Valentine 3D, Beetlejuice, Children Of The Corn, Dawn Of The Dead, The Devil's Rejects, House Of A 1000 Corpses. Night At The Roxbury. I love hard rock and heavy metal music. My Chemical Romance, Avenged Sevenfold, Aiden, Simple Plan, Rob Zombie, Marylin Manson. I also love 80's pop and rock. Carrie, Pet Cemetery, Children Of The Corn. Almost anything Stephen King. The Lord Of The Rings, Harry Potter. At Elm Street and Camp Crystal Lake, it looks like Jenny is neighbors with none other than Freddy Krueger and Jason Voorhees! What luck! I'd say they're neighbors only a scream queen could have. Also, check out Jenny's self-portrait in photos--Things That Define JK (Jenny Krueger)--by clicking here! It's a lot of fun! Plus, you'll easily get to know Jenny a lot better at a glance! At least a few photos require a bit of explaining, and Jenny does a screaming fine job of doing it. Here's one final fact as interesting and unique as Jenny herself. Whereas many bloggers avoid spam like the plague and pay large amounts of ransom to avoid it, Jenny openly invites it. Yes, you read that right; she invites it, no doubt with a smile (or a scream) as well. "Spam Me!!!" Jenny says. Any questions, comments or concerns, please email me at misskrueger666@hotmail.com" So, go ahead and send Jenny those questions, comments, or, in the unlikely event, even concerns. I'm sure she'll be screaming happy to get them!